Life is good for me and my twin sister i can say..... we're so close together since we're kids, though we argued sometimes, well, just like normal sisters do, but we shared slmost everything and understand each other most of the times, in short we are bestfriend. My husband known his bestfriend dario for 18 years now, treated as brothers actually, and i've known him personally for a year now. Dario is a person who is so loyal to his friends and family, infact when he is your friend he will stand by your side no matter what or he will be a friend if no one will. He is a joker too just like my husband. Knowing him made our lives more happier. 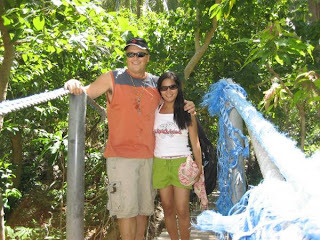 Their relationship started 2 years ago when my hubby invited along dario in his last visit in the philippines. Prior to that, delia and dario chatted for quiet sometimes as friends. They had an instant connection right there and then during their first meeting together. When dario came back home, they constantly communicating together everyday through chatting, he went back last year to visit Delia again, they had a blast together and found a true love in each other's arm. After 2 years, they will finally tie the knot as man and wife in one of the catholic church in our hometown. My husband and i are so happy with our family, that they end up together as they are perfect for each other, they are really a blessing to us and to those people who know them. Best wishes for them as they enter the journey of married life, its not always a honeymoon stage, there will be bumpy roads along the way but with God, respect and trust with each other, everything will be fine. I love you both! Congatulations!